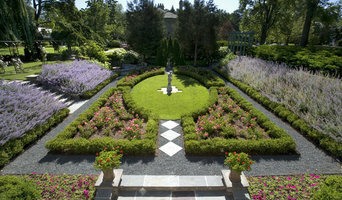 NLH Landscape Architects is an award winning woman owned landscape architectural firm in the Chicagoland region. Our services range from site analysis and conceptual design to final design, cost engineering, construction documents and project management. We strive to provide personalized creative design solutions that are environmentally sustainable and compatible with the client's budget and time requirements. $100 donation on behalf of new clients! Anne Roberts Gardens, Inc.. provides urban landscape architecture, design, construction and maintenance services for commercial and residential clients. We are certified by The Chicago Botanic Garden as Midwest Ornamental Plant Specialists so we know what grows ! We design and install one of a kind landscapes including elements of outdoor kitchens, decks, fire pits, brick and stone patios and walkways, Green Roofs and customized Storm Water systems to manage water on our clients sites. More than just excellent customer service, the key to the company’s success has been using industry innovation to achieve sustainability and environmental consciousness for our clients. This is realized through continued education, proper plant selection, installing water saving native plant gardens, rain gardens, and pollinator gardens. Anne Roberts' lifelong passion for growing plants found her earning a degree from the School of the Chicago Botanic Garden and earned a Master Gardener Certificate from the University of Illinois Extension, Chicago. Today Anne Roberts has the distinction of being the designer and horticulturist for North America’s largest green wall. We believe in details. We believe in problem solving. We believe in artistry. ==Designers and Builders of Complete Outdoor Environments==Each design that we conceive is a unique, artistic response to the individuality of your home and your desires. We specialize in designing and building outdoor living environments, swimming pools, and fine residential gardens. Our mission is to create beautiful, livable, outdoor spaces that meet our clients' aesthetic, functional, and economic goals, while respecting the environment. Our perspective is informed by a deep admiration of historical architectural styles coupled with a strong drive to create unique, custom tailored spaces. No project is "too small" or "too large". We service the entire Chicago, IL North Shore Region and surrounding suburbs. At Arrow, our main focus is design. Our keen eye for architectural details and our sense of spatial balance allows us to design on a variety of scales from intimate garden spaces to grand formal living areas. No detail is spared - we look at the overall site to begin a design and we pay close attention to sub-surface features that affect the performance of the environment including the mechanics of site grading and drainage. We are licensed landscape architects in the State of Illinois and we are national and state members of the American Society of Landscape Architects. Whether you're looking to renovate the front entrance of your home or are contemplating an elaborate poolside retreat, please email us and we'll setup an initial meeting to walk you through our process. The work of this outdoor professional includes most everything surrounding a home's exterior. 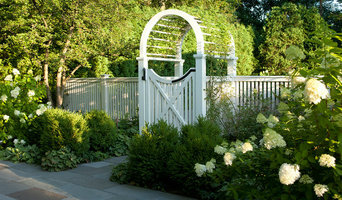 A landscaping architect can even work with the home architect to choose the right spot for your Highland Park, IL house. From there the Highland Park landscaper will develop preliminary concepts for your front or backyard design based on individual needs including the climate and activities that will take place, as well as layouts and planting plans. Landscape architects will also design any structures or outbuildings that will be added to the space. Any grading changes that will be added to the yard are also the responsibility of the architect. This includes any drainage modifications. An engineer can also be responsible for these tasks, but licensed Illinois landscapers are fully capable. Like building architects, they will produce preliminary concept drawings as well as detailed construction documents and planting plans. Three-dimensional renderings and illustrative plans are all supplementary. 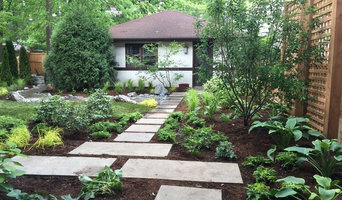 A Highland Park landscaping designer generally will have ecological, aesthetic and technical training, which helps them maximize the potential of your outdoor space. Keeping in mind both style and functionality, garden designers analyze your architecture and yard to produce a plan that may or may not include location and materials for walkways, patios, water features, fences, garden aspects and more. In addition, a landscaper in Highland Park, IL will carefully assess your geographic region to choose plants, trees and flowers that will flourish naturally, as well as address concerns such as drainage, screening and soil conditions. Certain landscape designers only help with the planning portion, while some may deliver the plans and then oversee a hired landscaping contractor. Others — typically following a design-build approach — take care of both the design and all aspects of the landscape architecture and construction. 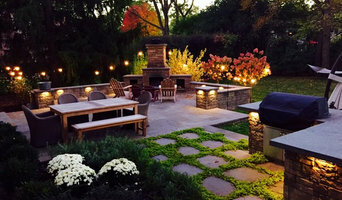 Find a Highland Park landscape architect on Houzz. 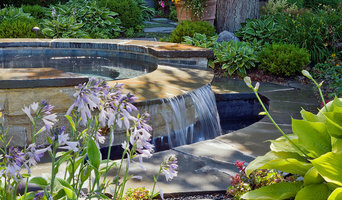 Narrow your search in the Professionals section of the website to Highland Park, IL landscape architects and designers. You can also look through Highland Park, IL photos to find a space you like, then contact the professional who posted the photo.